Wygwam’s WYSIWYG editor is based on the powerful and accessible CKEditor 4, which we’ve custom-tuned to work exceptionally well with ExpressionEngine. Create multiple reusable Wygwam configurations with the easy-to-use config editor, including a drag-n-drop toolbar designer. 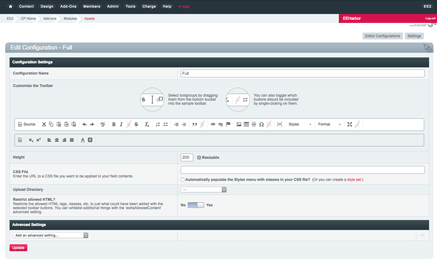 Easily create multiple editor configurations with custom toolbars and settings. Connects to EE’s file manager as well as Assets. Quickly link to your EE and Structure pages. Beautiful & Powerful Text Editor Now available for EE3!